Gerard Mulot, one of my favorite boulangerie/patisserie has finally opened a shop in the Marais. Always having to pleasantly schlep to the Saint Sulpice location, I am thrilled, plus a little scared for my waistline, that the new shop is only 3 blocks from me. A few weeks ago as I was giving an Eye Prefer Paris tour, walking near Place des Vosges, a boulangerie that I never gave much notice to, had large shades in the window with the familiar, fancy script Gerard Mulot logo. With the glee of a child discovering a new ice cream flavor, I immediately bolted inside with my clients. 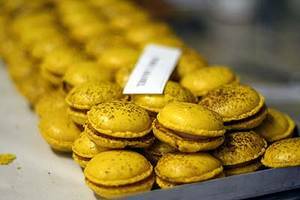 We pressed our noses against the glass, practically licking the case stacked with rows of rich paint chip colored macaroons, dainty petit fours, glistening chocolate concoctions, sculpted cakes with architectural shapes on top, and other pastry works of art. I miraculously exercised some self -control and chose a croissant. But what a croissant! Buttery, flaky, and divine,they have consistently been named one of the top croissants in Paris, and I can see why. After serious contemplation, my client selected a red plum tart. We went to a nearby café for a coffee and she whipped it out and asked me if I would like a bite. Before finishing her sentence, I said yes and practically ripped it out of her hand. I took a bite (as big a one I could manage without being a pig) and nearly passed out from the taste rush. I recovered fine and basked in the glory of my new food find. Gerard Mulot is now a permanent stop on all my Marais Eye Prefer Paris tours. includes many of the places I have written about such as small museums & galleries, restaurants, cafes & food markets, secret addresses, fashion & home boutiques, parks, and much more. Great discovery and I agree a real good thing. 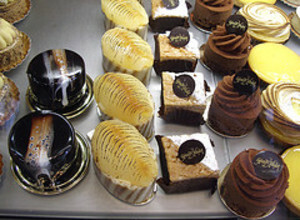 Have you ever try the restaurant, just next door the pastry shop, called Les Bonnes Soeurs at 8, rue du Pas de la Mule. It have a great rapport-qualité prix. I just wanted to thank you again for your work of sharing all your Parisian discoveries. They mean a lot to me (I lived in Paris for 9 years) and make me smile. Thanks Patricia for your support and your kind comments. Jean Michel- I'm glad make you smile and thanks for your loyalty. Luc- I've passe that restaurant many times but will now try it on your recommendation. thanks for the tip.